Inspiration take from etsy at Annie Reh’s store. Visit her at https://www.etsy.com/shop/AnnieReh?page=1 for lots of beautiful inspiration! 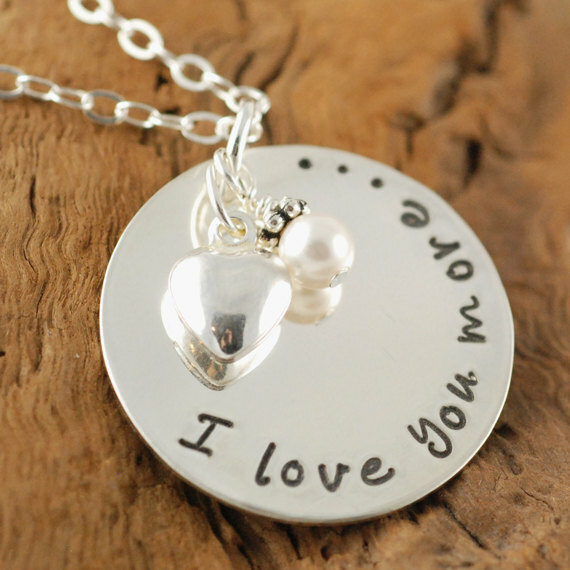 Description: Make two personalized, hand stamped necklaces. We will provide all supplies, including two 1 1/4″ aluminum discs, charms (variety of beads to choose from), and two chains. Due to the letter stamps and tools, this project will NOT be available as a kit. However you can pre-pay and reserve a kit to be completed at the September or October Pinspired meeting. Approximately 6-7-8 letters will fit across the necklace horizontally (depending if you use uppercase or lowercase), and approximately 22 characters will fit following the curve of the circle. You could also stamp up to 4 lines. Need some inspiration? Personalization ideas: Grace, Joy, Love, Faith, [kids names], be happy, [bible verse reference], live laugh love, all you need is love, no matter what, there is always hope, wish, those who care teach, [special date], big sister, go [sports team/school mascot], believe in miracles. RSVPs for this craft are due by Wednesday, July 16 so we can buy supplies ahead of time. Due to the letter stamps and tools, this project will NOT be available as a kit.